Today in Masonic History John Brown is born in 1800. 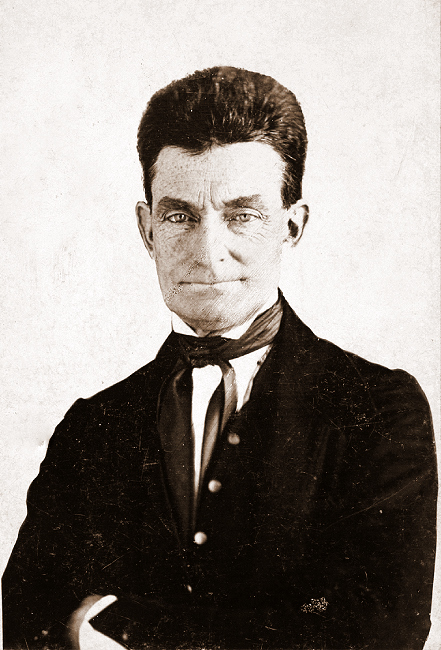 John Brown was an American abolitionist. Brown was born in Torrington, Connecticut. In 1805, the family moved to Hudson, Ohio where Brown's father opened a tannery. Brown's father had an apprentice at the tannery Jesse R. Grant father of future General and President Ulysses S. Grant. At the age of 16, Brown headed to Plainfield, Massachusetts to attend private school. He was planning on becoming a Congregationalist minister but money ran out. From 1816 to 1836 Brown had married twice and had moved his family around between Massachusetts and Ohio. In 1837, Rev Elijah P. Lovejoy, an abolitionist, was murdered in Illinois by a pro-slavery mob. When the news reached Brown he declared publicly "Here, before God, in the presence of these witnesses, from this time, I consecrate my life to the destruction of slavery!" This would be a foreshadowing of the years to come. Over the next next decade Brown started working in the Sheep and Wool industry. He would become partners with Simon Perkins. In 1846 Brown and Perkins moved to Springfield Massachusetts. This would be a major turning point for Brown. He was already a staunch abolitionist, in Springfield he found himself surrounded by a majority population of abolitionists. Brown learned a great deal about abolitionism and the underground railroad while in Springfield. In 1850, the United States Congress passed the Fugitive Slave Act, this required even free states to aid in the return of run away slaves and provide heavy penalties for those who helped run away slaves. Brown was angered by this legislation, in response he created The League of Gileadites, an organization dedicated to protecting run away slaves with violence if necessary. Mount Gilead, in the bible, was the place that Israelites would gather in order to face their enemies. From the founding of the league onward no run away slave was taken back in Springfield. It was also in Springfield that he developed the idea that if slaves were to rise up and try to take their rights for themselves, that white Americans who loved an underdog, would stand behind them. This was something of a foreshadowing of the coming events in Kansas and Virginia. In 1855, Brown headed to Kansas. He was informed by his adult sons who lived in Kansas that the pro-slavery forces there were trying to bring Kansas into the Union as a pro-slavery state. Brown believed that he could stop that and headed with a group of abolitionist settlers west to Kansas. Once there it wasn't long before Brown determined that terrorism, fraud and deadly attacks were required to bring Kansas into the Union as a free state. In 1856, Brown, feeling that he had no other choice than violence, attacked a group of pro-slavery settlers in Pottawatomie. None of the Pottawatomie settlers owned slaves, although two were said to have been bounty hunters who had gone after slaves in the past. Five of the pro-slavery settlers would be killed, the event would be called the Pottawatomie Massacre. This led to several skirmishes between Brown's abolitionist forces and pro-slavery forces both in Kansas and surrounding states. Two of Brown's sons would be captured, he would secure their release by exchanging a captured colonel from the Missouri militia and his men. After the events in Kansas, Brown would return to Massachusetts. He would spend the next several years gaining financial resources and other materials to arm his men. On July 3rd, 1859, Brown and his men attacked Harpers Ferry, Virginia. Brown had intended to use the weapons in the armory there to arm local slaves. They never made it to the armory and Brown and his men were captured. They were tried and convicted of treason against Virgina. It was the events at Harpers Ferry that almost all historians agree was the start of the American Civil War. On December 2nd, 1859 Brown wrote "I, John Brown, am now quite certain that the crimes of this guilty land will never be purged away but with blood. I had, as I now think, vainly flattered myself that without very much bloodshed it might be done." He was then led to the gallows and was executed per his sentence. Brown was a member of Hudson Lodge No. 68 in Hudson, Ohio.